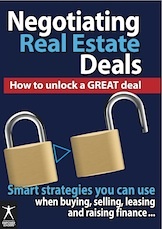 This new book Negotiating Real Estate Deals - How to unlock a GREAT deal is based on proven material and the experience of masters in the area of property deals and negotiation -- see ’What’s covered’ below. ’Negotiating Real Estate Deals - How to unlock a GREAT deal’ will give you valuable and useful pointers — tips for your own successful negotiations. This eBook gives you the chance to learn from the experiences of others -- as Dolf de Roos says: "Improve the most valuable real estate you own: the six inches between your ears." Negotiating Real Estate Deals - How to unlock a GREAT deal is about learning skills and information that will make a difference to your deals -- buying, selling, leasing raising finance -- and much more. It’s about HOW to work the negotiation so you get the best deal you can. Not only that, what you learn are transferrable skills -- things you learn in one context can be useful to you in another. You can look at real estate investing as a game ... but it isn’t gambling. It also isn’t about ’get rich quick’ -- that said, I have personally, no bull, made tens of thousands of dollars of instant equity by buying property well -- through negotation. And there are many others I’m sure who have done far better than me. So, if you see property investing as a game, negotiating is one of the key skills players must learn -- the skills are vital, because a mistake can cost you serious money -- and doing it right can literally (not figuratively) make you a fortune. What’s covered? If you’re interested, and want to know more, have a look through to ’What’s covered’ and read about some of what you can learn from this new eBook ... learning HOW TO DO IT BETTER from people with genuine experience.